This time around, I’m taking the opportunity to talk a little about a couple of very different horror movies – a Mario Bava giallo from the 1960s and a German-British historical horror feature from 2010. Countess Christina Como (Eva Bartok), recently widowed, has converted her expansive mansion into the hub of a high fashion empire, and is holding a grand salon there displaying her designers’ latest creations. Meanwhile, her designers, models, and other employees are embroiled in all sorts of tangled personal affairs, ranging from the deeply embarrassing to the actively illegal. Thus, when a mysterious masked figure begins a campaign of murder and terror against them, they fail spectacularly to co-operate with the police. The confusion allows the killer to keep things going to a terrifying extent, and as individual members of the salon try their own snooping, it’s hard to say who is truly determined to find the murderer, who is just trying to cover their back, and who has far more malevolent ends in mind. 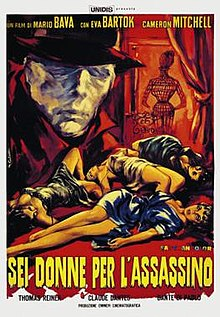 Though Mario Bava’s preceding The Girl Who Knew Too Much is considered the first giallo film, I’d argue that it’s with Blood and Black Lace that Bava both hit on the archetypal giallo formula (right down to the killer’s garb) and, more importantly, the distinctive giallo atmosphere; The Girl Who Knew Too Much is just slightly too jolly and comedic for me to feel like it’s a true giallo – some of the comedy was, of course, added in the American cut of the movie (Evil Eye), but it was still present in the original. Conversely, Blood and Black Lace has the same mix of aesthetic luxury, eroticism, and horror that is distinctive to giallo and which The Girl Who Knew Too Much didn’t quite hit. Bava also breaks from the standard whodunnit formula in a major way by revealing the killer’s identity well before the climax, and showing their planning process from the inside for the final go-around. To be honest, I find the movie comes a little unstuck after that, taking a bit took long to work its way through the final stages of the plot, but the movie is nonetheless still a classic of its subgenre. I particularly liked Thomas Ranier in his role as the disapproving police detective whose efforts to solve the case keep being tripped up by the self-serving lies and chicanery of the main characters. It is the 1300s, and as the title implies the Black Death is sweeping Europe. In a monastery struggling to contain the infection, Brother Osmund (Eddie Redmayne), has been kept quarantined, but is let out to join the prayers for one of his fallen comrades when he shows no symptoms of the plague. The next day, though, we see him stealing food and slipping out into the town to rendezvous with Averill (Kimberly Nixon), a woman that he is carrying on a secret affair with. Witnessing the dead piled up in the streets, Osmund tells Averill to take the supplies he’s obtained and go and hide in the forest until the plague passes; she ponders whether God is punishing the two of them for their sin, and whilst Osmund denies this, he also refuses to come with her, being willing to break his vows but not willing to abandon them entirely. Osmund’s faith and character will soon undergo sterner tests, however, for he soon takes up a challenge his brothers fear to take: to accompany the Bishop’s envoy Ulric (Sean Bean) and his mercenaries on a mission as a guide and as theological counsel. Rumour has it that a certain village in the marshes close to where Osmund was raised is not only completely untouched by the plague, but is home to a necromancer who can return the dead to life. Ulric and Osmund’s task is to establish the truth of these stories; if the village has turned to Godless and sacrilegious ways to protect them, then they must be discredited and punished less others in their desperation abandon the Church. A German-British coproduction (the story development and ideas came from the British side of the equation, the funding and locations from the Germans), this was directed by Christopher Smith, who made substantial changes to the conclusion of the film, which as originally scripted by Dario Poloni took the movie down an unambiguously supernatural route. In contrast to this, Smith goes for a more subtle, psychological approach, in keeping with his bid to go for a grimly realistic depiction of the time. You could probably characterise this as a full-blown grimdark piece, in fact, though frankly the Black Death was such a nightmarish period of history in Europe that if you don’t go dark with it you aren’t facing up to just how awful it was. Smith even gets minor historical points right, like remembering that the medieval church as an institution was more concerned with heresy than it was with witchcraft, but that the Black Death saw sentiments against witches becoming substantially more prevalent. The group’s journey through the plague-ravaged landscape early on not only helps to establish the distinct characters of the various mercenaries, but also helps to drive home just how apocalyptic the Black Death was. Remember, this was a disease where if you say it decimated the population, pedants will point out that if anything you are underplaying just how awful it was, with recent research suggesting that about half the population of medieval Europe died of it. Panicing mobs burning a witch or turning to murderous banditry because they can’t think of anything else to do, entire depopulated villages, the discovery of plague within the party itself – all these incidents play out on the journey and make it obvious that the Bishop’s worries about people turning away from the Church are not mere control freakery. We are watching these people work their way through a disaster of such a magnitude that every certainty in their life has been brushed aside and the entire social order is disintegrating not because of any great revolutionary impulse on the part of anyone but simply because people are dying at too great a pace to keep it together. The ending, in which Osmund finds himself becoming a killer as brutal and merciless as any in Ulric’s band (and he’s murdered at least one person for absolutely no good reason, though he is more than capable of denying this), and in which it becomes apparent that the entire mission has done no good at all beyond murdering a village full of people who just wanted to be left alone, is the final touch of bleakness on what is a decidedly bleak prospect. Although it is possible to see the film as a slam on organised religion in general, to me it comes across more as a condemnation of what happens when religion or irreligion alike take to violence to serve their ends.